2 boldly contrasting black and white "stick figure" love cartoon characters which review a love message by combining the design patterns together.... let's here it now; "Awwww!" I know, right? Coffee mugs (Set of 2). Stoneware ceramic. Microwave-safe. Dishwasher-safe. Volume: 14 oz (385 ml). Height: 4 inches (10.2cm). Depth: 3.5 inches (8.8cm). Image printed all the way around on each mug. Featuring 2 boldly contrasting black and white "stick figure" love cartoon characters which review a love message by combining the design patterns together. They are perfect wedding gifts for couple and anniversary gifts. Actually, what is cool is that this company has a ton of 'couple' gifts like this. Pillowcases, glasses, mugs... all with different little designs in the red and black color scheme that are cute on their own, but even cuter when you put them together! Height: 4" Width: 5" Depth: 3.5"
When I'm sitting in my office and I've come to the end of the internet, I often stare out the window and try to think of a post topic that somehow involves coffee. Today I thought to myself; "My pants are so comfortable...." and suddenly the image of pajama pants with a coffee theme came to mind. Bingo! There's something to search for on Amazon. Surprisingly, there weren't as many product options as I thought there would be. The first ones were pink... and girly... but very cute! And comfy looking. For exact size recommendations please see product description. They do have other colors, but they don't have coffee cups. They have leopard spots, colored circles, snowflakes and such. This one is actually from PajamaGram so it's a shirt AND pants. Hence, the $50 price tag. But I have to admit, I love that t-shirt!!!! 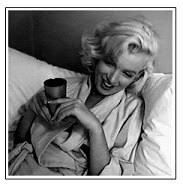 If you click on that image and go to their page you will also see similar coffee themed pajamas for women (CUTE!!!!) and even adult FOOTIE PAJAMAS! LOL. Very fun. It's SUPER affordable at about $16... but that is because it's made in China. Now the surprise... in my search, THIS came up! Big Bang Theory Bazinga! Knit Sleep Pants! And admittedly... after that, I got lost in searching for other Big Bang Theory clothing and fun items.... so that concluded my search for coffee themed pajama pants. Oh my gosh, it actually exists! Marshmallow Coffee! As I sat in my home office sipping coffee and glancing outside the window to the heavy, gray clouds in the sky that promise to bring snow flurries tonight, my mind drifted. Coffee. Hot coffee. Fires. Bonfires. Marshmallows. "I wonder if they make a marshmallow coffee?" So of course I immediately did a search and sure enough... found "The Coffee Fool" offers a Melty Marshmallow Coffee grind! sweet satisfying aroma in the night air." The description above is straight from their own site and doesn't offer much byway of a good description of flavor. Amazon did not have any reviews as of my post either so at this point the flavor of a marshmallow is only available in my creative mind. I am tempted to order it from Amazon but to be honest I'm on a tight (oh so horribly tight) budget and I have a wishlist about 30 items long that would probably come before splurging on a new flavor of coffee. So I'm going to ask you, my readers. Have you tried it? Does the marshmallow flavor stand out? Is it mostly an aroma that is lost in sipping? What do you think? This morning my mind is on camping so that is where my posts are going. Unfortunately for me, my husband doesn't like camping so I don't get to go often enough. Fortunately however, he does like looking at and buying the camping gear. And we both like having it as back up in our emergency storage. If the power goes out due to storms or other man made issues, it's a great excuse to have fresh coffee over a fire because really... the best part about mornings at the campsite? That first cup of coffee. That same 'comfort' is needed when you are without power for a couple days due to ice storms or other harsh weather. So without further adieu, this is admittedly my 'camp coffee' brewer. A basic, aluminum, cheap coffee percolator. Yes, there are other options (which I may post about tomorrow or this week) but today this is the style I actually own. It's lightweight so it's good for packing. It also does not have a side handle as it takes up less space this way. Instead, you have a metal ring on the side and the wire handle on top. Have a stick or hot pad or fabric handy to grab the side ring when your coffee is done. It also helps if you flip the metal ring 'up' when you put the coffee on so you aren't trying to grasp it later when the pot is hot. Officially it says it's a 9 cup pot but that is assuming you drink little espresso sized cups. I mentally think of it as a 4 cup pot. Fill the pot with water, assemble the stem and basket and put some coarse ground coffee in the basket. If you like it weak, then about 1/2 the basket will do. We like our coffee strong so we almost fill the basket. Don't use finely ground coffee as you are more likely to get grounds in your cup. A courser grind won't go through the basket filter. Place the top on, put it over your fire or camp stove, and wait for it to 'perc'. You will see the liquid splashing up into the little clear bulb on top (if you are not familiar with this style pot) and you will know it's brewing. If your fire is really hot, move the pot to the side or up higher if it's on a tri-pod stand. You want it to basically 'simmer' not furiously boil. The coffee gets stronger and darker as it percolates so give it a couple minutes of regular percs before you start to pour some coffee. Clean up is just dumping out your grounds and rinsing it out. If you've cooked over an open fire, then the bottom will be black so you'll have to scrub that if you are picky. I rub the bottom with a bar of soap before using it, which makes it easier to clean the black off the bottom later but I just clean most of it off and call it 'good enough'. I store ours in a gallon baggy with a second baggy of coffee stored inside the pot. You can find these from about $9 - $25 depending on the brand and store. They are currently about $12 at Amazon. Yes I love my Keurig and we use it every day... but sometimes if I know it's going to be a 4-5 cup morning or there are 2 or 3 of us drinking morning coffee, or I'm having guests, I like to have a back up! It's easy to go through a $12 box of k-cups in one sitting if you are entertaining coffee drinkers. That is why I love having a 'regular' coffee pot to fall back on. Currently that is my Hamilton Beach Brewstation which I really, really love but I bought it about 8 or 9 years ago and it has a flaw. The heating element is in a position so it dries out the seal on the carafe and it leaks. To remedy that and buy a little more life out of my favorite coffeemaker, I used silicone sealant, sealed the edges, let it dry and got a few more years out of it. But I have to admit, it's time has come. (They changed the design and fixed this design flaw since then). I must invest in a new 'back up' brewer. That is how this post was born. I bought a TV for my oldest daughter, who has just graduated college and lives in a place of her own 1100 miles away. I had it shipped to the Best Buy store closest to her home for easy pick up. Apparently they were offering a promotion at the time to receive a $15 gift card or gift code when you used the ship-to-store option. I got my code yesterday and immediately thought; "I bet I can put it towards a new back up coffee maker!" 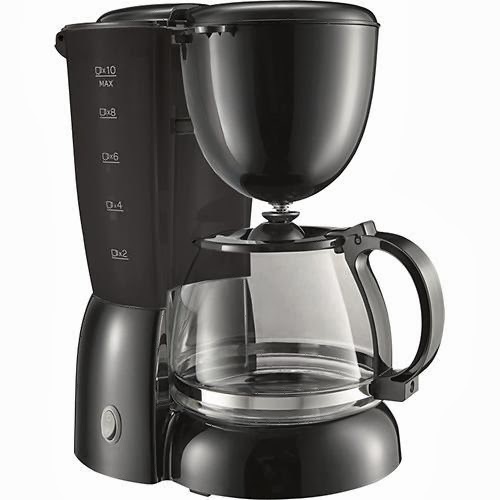 I was thrilled to find the Mr. Coffee (12 cup, programmable) normally $30 on sale at Bestbuy.com for $14.99 but then I saw this one... a 10 cup basic, no bells and whistles brewer with a built in brewer basket so you don't need a filter. Love that option. What to do???? In the end... I got both! For a grand total of $10 with shipping and handling and tax, I just got 2 coffee pots. One of which, I wanted to share with my readers... if you need a dirt cheap, basic coffee pot, how does a $4.99 brewer sound? Complete your morning ritual with this SA-PDCM01 10-Cup drip coffeemaker that features a dishwasher-safe glass carafe and a removable brew basket for easy cleaning. A water level gauge on the carafe makes it simple to brew plenty of coffee. On/off button for simple operation. Along with a removable brew basket allows simple cleaning. a few cups of coffee a day is as hydrating as water"
The Birmingham University researchers called for health advice to be updated to reflect their findings. Sports scientist Sophie Killer said that the idea that coffee dehydrates stems from research done on samples of caffeine over 80 years ago. However, caffeine and the many other compounds in coffee interact with each other and so the 1928 study isn’t necessarily relevant to daily life. To find out, the researcher asked 50 healthy men to drink either four mugs of water or coffee a day for three days and then switch. The men ate the same food during the two parts of the study and were banned from vigorous exercise and alcohol. Tests of blood and urine samples showed the men were just as well hydrated when they drank coffee and when they had water. They also passed the same amount of urine, the journal PLOS ONE reports. The European Food Safety Authority recommends that women should drink about 2.8 pints of fluid and men should drink about 3.5 pints of fluid per day. However, some experts say that coffee doesn’t count towards this. Others advise that every cup of coffee or tea drunk is matched with a glass of water to protect against dehydration. But Miss Killer said that her industry-funded study shows that coffee doesn’t dehydrate – at least when consumed in moderate amounts. She said: ‘It is a common belief that coffee consumption can lead to dehydration and should be avoided, or reduced, in order to maintain a healthy fluid balance. Dr Frankie Phillips, of the British Dietetic Association, said a small, strong coffee such as an espresso might dehydrate. However, any diuretic effect of caffeine in a normal cup of coffee is more than balanced by the amount of water in the drink – leading to hydration. She added that a couple of cups of coffee in the morning could ‘add something useful’ to someone’s day. Tea drinkers can also take heart, with a similar, earlier, study concluding that it also does not bother the bladder more than plain water. Just returned home from a day of running errands, the last of which was to the grocery store where I needed to purchase some k-cups for my Keurig. I like to save money on k-cups by purchasing them through Amazon or at Sam's Club however, sometimes I don't want to make the drive or wait for delivery. In that case, I usually pick up a 'frugal' choice of brand or roast at the grocery store. Today... that happened to be the Gevalia coffee in k-cup pods. At $6.99 regular price for a box of 12, they are one of the more affordable brands this week and they offered 2 varieties; their signature blend and a Colombian. The Colombian says it's a nice bold, rich roast so it was my choice. I also noted it had a $1 peel-off coupon on the side. Since 1853, Gevalia has upheld the uncompromising standards put forth by our founder, Victor Theodor Engwall. Opening his business in the small seaside town of Gävle, Sweden, Engwall aspired to import nothing less than the world’s finest beans. Coffee aficionados soon learned that if you wanted good coffee, you bought it from Victor. Business grew quickly, and Gevalia became the official coffee purveyor to the Royal Court of Sweden. The Gevalia Columbia Coffee Pods is purported to be a rich, bright and well-bodied coffee, made with 100% Colombian beans. So... what do I think? The Keurig offers 3 brew settings; 6, 8 and 10 oz. I usually choose the 8 oz. and I did so this time as well. The color wasn't quite as dark and 'bold' as I thought it would be but that doesn't mean anything. Just an observation. The first sip, I immediately tasted that "Gevalia" taste that is with all their beans. I've tried to describe this taste over the years and I've never been able to find words to describe it correctly. Gevalia coffee has a certain taste to it that I have found encompasses all the blends I've tried. My history with Gevalia coffee's is from 2000 - 2005 I took part in their automatic home delivery system and had between 2 and 4 boxes delivered to my home on a regular basis. I quit the service not only to save money, but also because we were switching to a Keurig brewer soon and mostly... that distinctive something-'taste' that I was growing tired of. I'm drinking the coffee now and I can say it's a smooth coffee. Not bitter or burnt tasting. Very smooth and light. It's a bold and dark blend supposedly, but as a person who drinks their coffee extremely hot, dark and black... I don't think it's 'bold'. I think this is a coffee I could serve to my parents or guests and not be concerned it was too bold or dark for them. It almost has a floral overtone to it - and that something-distinctive taste undertone that I still can't describe. Kind of earthy and reminds me of chewing on weeds... but not really. I've tasted this in their signature blend, their darker blends as well as their 'flavored' coffees of which I've had everything from vanilla to hazelnut and mocha and raspberry blends. They all have that 'something' undertone and I've tasted with both their whole beans and ground. In general, it's drinkable. I almost think I'll enjoy it as an afternoon and evening coffee or with a dessert more than I will as a 'wake me up' morning coffee. Even though it's Colombian and brewed at the medium setting to give it a bolder taste, I think I may have to go down to the 6 oz. water setting in order for it to be my 'morning' coffee. I'm going to give it a 3 out of 5 stars. It's good and enjoyable but a bit too light and floral for me considering it's supposed to be a bold, Colombian blend. I really think the average coffee drinker would like it though and it does go down very, very easily!